Weather: It was overcast through much of the day with some rain. This evening the clouds broke a little bit and let the sun shine through for a half hour or so before sunset. Winds were light. Birds: A number of birds were singing throughout the day around the house. Of particular note was a Pacific Slope Flycatcher. It is the first time I have heard one of them in the neighborhood. The Townsend’s Warblers do not seem to be singing so much in the last couple of days. 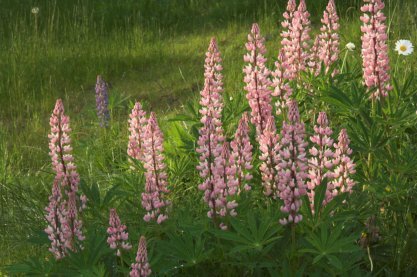 Flora: The lupine in our yard are going strong. I think most of them are a domestic variety, but there is one purple one. I don’t know if it is a native plant, or the offspring of the others in our yard (possibly crossed with a native plant).